Editing and formatting are very good, I noticed no significant glitches. Layout adheres to a beautiful 2-column full-color standard and the pdf comes sans bookmarks, but needs none at this length. Annoying: The scroll that contains the header obscures location #1 on the map in its entirety. Cartography is full color and nice. Huge plus: We get a GM AND a Player-version of the area in which this takes place, providing full VTT-friendly compatibility. 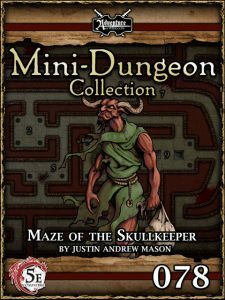 Justin Andrew Mason’s maze of the skullkeeper is a cool, deadly gauntlet. The layout glitch is a bit problematic and a reference to combined strength to remove something is a bit odd for 5e. The conversion by Kyle Crider and Chris Harris is solid. Still, in spite of these guffaws, this is worth checking out – my final verdict will clock in at 3.5 stars, rounded up due to in dubio pro reo.